A Willemstad poster promoting Curacao Baseball Week 2015. Photo by Brian Major. If you’re an American who hasn’t traveled to the Caribbean, there are some things you should know before you visit. One thing you’ll undoubtedly learn within hours of arriving is that soccer is the region’s favorite sport. Enter a bar, turn on a hotel television, pass an electronics store or just speak with a local for more than a few minutes. You’re guaranteed to wind up viewing or discussing soccer. Although cricket runs a close second, soccer, which is known as “football” everywhere but in the U.S., is clearly number one in the Caribbean. Many times while in the region during a U.S. baseball or football playoff series, I roam doggedly in search of a Major League Baseball (MLB) or National Football League broadcast. So imagine my surprise at the developments of the past few years in Curaçao. Firmly entrenched in the southern Caribbean, the island is a constituent country of the Kingdom of the Netherlands and thus heavily influenced by Dutch culture. But while Curaçao’s Caribbean roots run deep, this tiny Caribbean nation has emerged as a hotbed for some of the very best players in Major League Baseball. Four Curaçao natives - New York Yankees’ shortstop Didi Gregorius; Atlanta Braves’ second baseman Ozzie Albies; Los Angeles Dodgers’ pitcher Kenley Jansen and Milwaukee Brewers’ second baseman Jonathan Schoop - are key players among the MLB teams in this year’s playoffs. The fact that so many Curaçao-born players have not only made MLB teams but developed into some of the sport’s best players is nothing short of remarkable. About one-seventh the size of Rhode Island, Curaçao is now the highest-producing MLB country per capita. In fact, in July Curaçao inked an “Official Destination” sponsorship agreement with MLB. The two-year agreement promotes Curaçao as “an ideal destination for emerging players and baseball fans,” in the Caribbean said Curaçao Tourist Board (CTB) officials. “Baseball is an avenue for our residents and fans to connect with one another and enjoy one of the world’s greatest pastimes,” said Hugo Clarinda, CTB’s deputy director. If there's an international ambassador for Curaçao’s extraordinary baseball culture, then Hensley “Bam Bam” Meulens, hitting coach for the San Francisco Giants and a longtime MLB player and coach, ably fills the role. The Curaçao native has been prominent in petitioning MLB to implement programs to develop his country’s young players. These days Meulens and other Curaçao players are giving back to their homeland by providing baseball training, advice and guidance that was largely absent when “Bam Bam” became a Curaçao baseball pioneer. So how did he break into MLB? Lots of hard work certainly played a role. But Meulens’ ascension to an MLB roster also featured a touch of magic as he received critical attention from the scout who signed one of baseball’s greatest players. In the years since Curaçao baseball players have risen to world-class status. “We have guys who have started off really good with their young careers and some who have [already] had great careers like Andruw Jones and Kenly Jansen, who has been in the league about seven years now and is one of the best closers in the game,” Meulens said. Today Meulens is a leading MLB coach who’s interviewing for manager positions this offseason. Beyond the baseball diamond, he spends most winters in his homeland, which he says offers a distinct take on the Caribbean experience. Of course, Curaçao also features the sunny skies, blue waters and beautiful beaches that are Caribbean hallmarks. “I’m a boater so we go boating on the weekend, and dock at Santa Barbara beach,” he said. 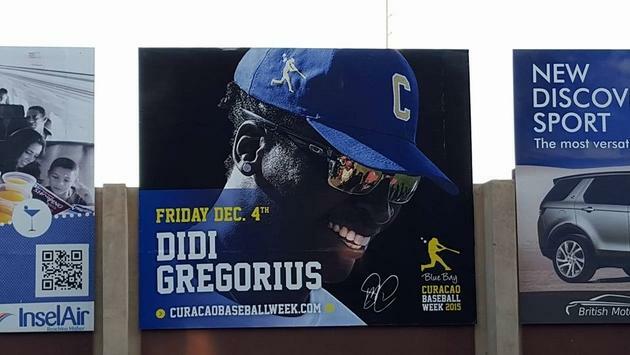 Meulens takes great pride in Curaçao’s baseball culture, reflected in the annual Curaçao Baseball Week, which has become a virtual homecoming for the great MLB players who hail from the nation. “There is something so special about seeing our Major League players coming home to the same fields they played on to teach our kids the fundamentals of the great sport of baseball,” he said.